This delicious Healthy Roasted Chickpea with Carrot Hummus is perfect for mindless munching, but with none of the guilt. 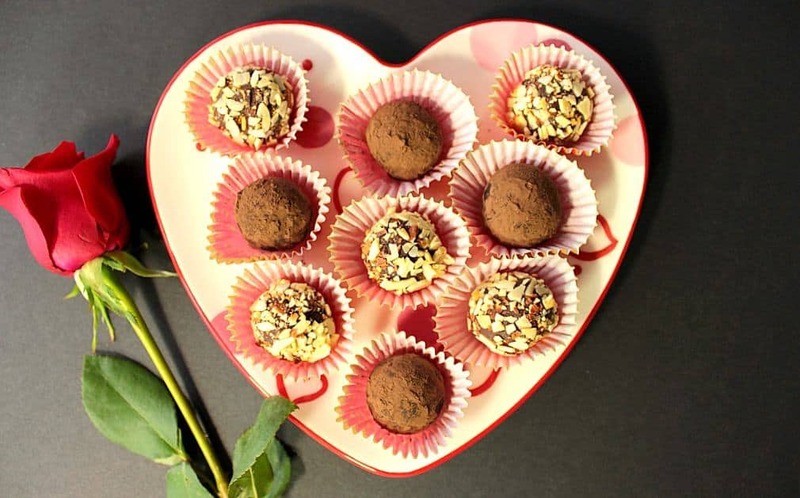 Here we are, well into January 2016, and this is the first healthy recipe I’m sharing with you. What the heck took me so long? I’m not sure actually, but better late than never. Right? Hummus is something that I really enjoy eating, and there are plenty of good brands on the market that I love, and purchase frequently. 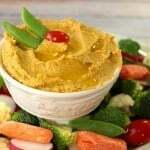 However, making hummus at home couldn’t be easier, and when doing so you can tailor it to your own tastes and dietary restrictions, as needed. Plus it’s great fun! 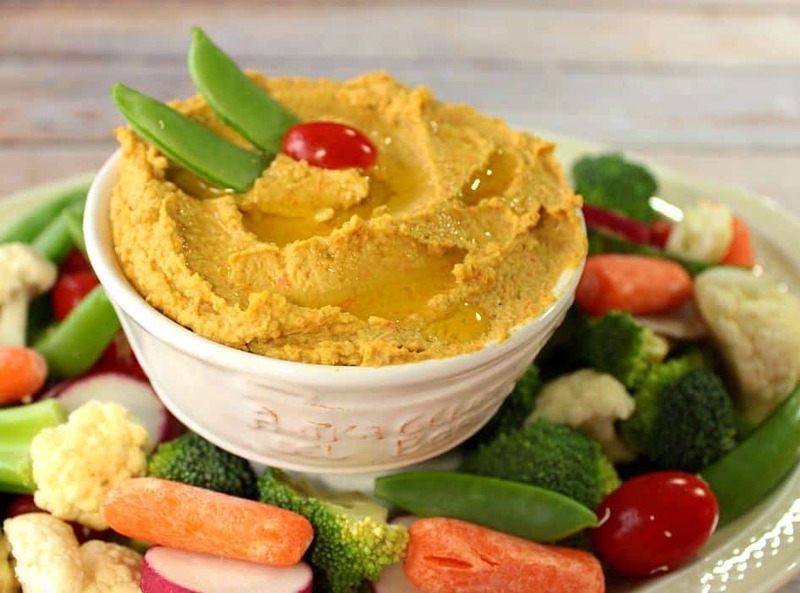 What gives this hummus that little extra something that you don’t normally get when purchasing store bought hummus is the extra depth of flavor that roasting the chickpeas and carrots provides. It’s thirty minutes well spent, and one that makes all the difference. 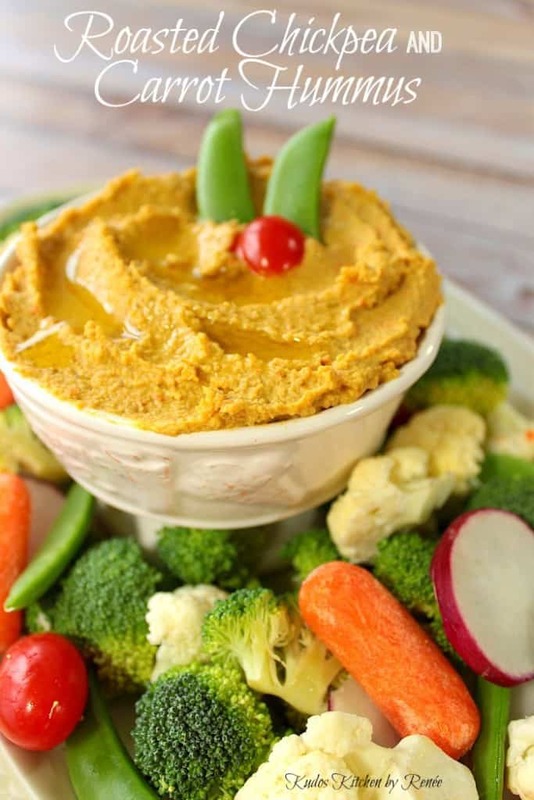 This delicious and healthy Roasted Chickpea and Carrot Hummus is great to mindlessly munch on with assorted fresh veggies. This is a no guilt treat. In a large bowl, combine the drained chickpeas, chopped carrots, olive oil, coriander, smoked cumin and garlic powder. 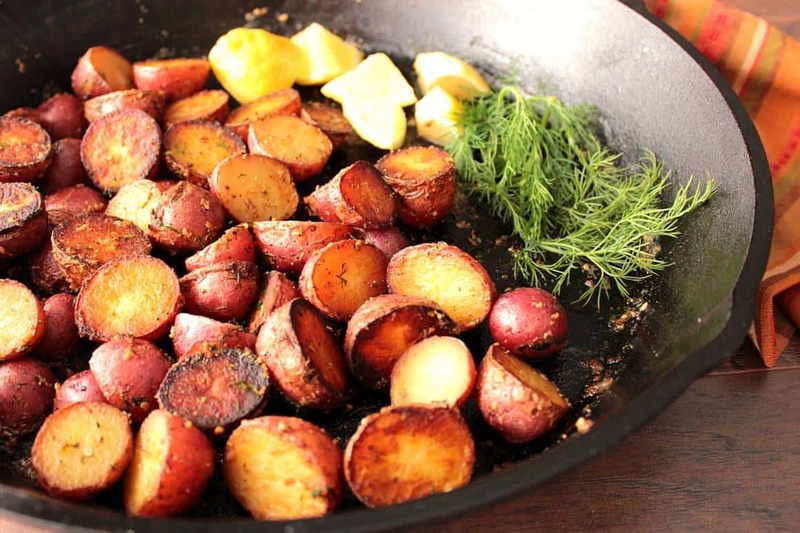 Toss evenly with 2 tablespoons olive oil. Roast in the preheated oven for 20 minutes. Stir well and return to the oven to roast an additional 10 minutes. Add the artichokes and cooled chickpeas to a high powered food blender or food processor. Add the water, lemon juice, tahini, salt and pepper. Blend or process until smooth. Add additional salt and pepper to taste, if desired. Chill (if desired) and drizzle olive oil over top before serving. 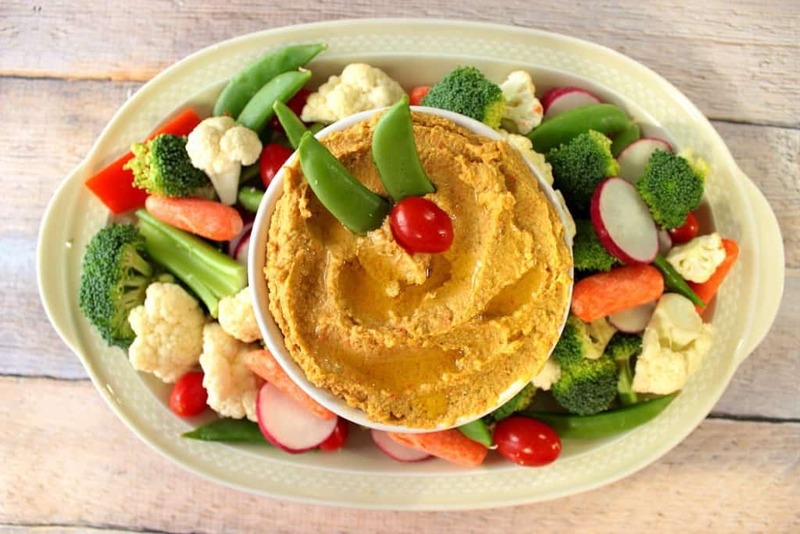 Serve with assorted fresh vegetables and/or pita chips. If you prefer a thinner hummus, add additional olive oil when blending or processing until you reach your desired consistency. 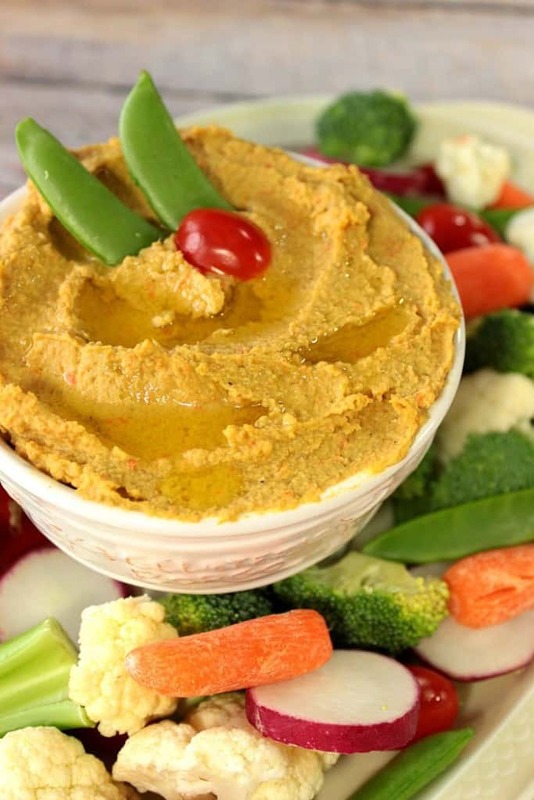 This hummus can be stored in an airtight container in the refrigerator for up to 2 weeks. When you’re kicking back after work and munching on this healthy Roasted Chickpea and Carrot Hummus, you might as well pour yourself a tall, frosty one! After all, you deserve it! 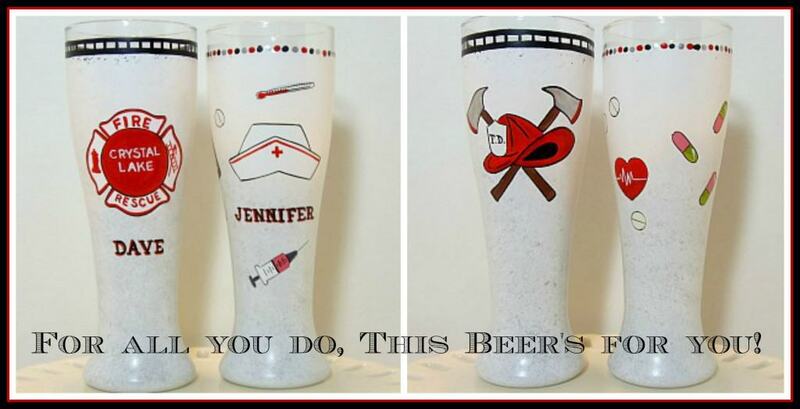 For all you do, these fun painted pilsner glasses are for you! If there is ever anything I can paint for you, from glassware to fabrics, please don’t hesitate to contact me (press the tiny envelope you see within my social media buttons), or visit my shop on Etsy and Wazala. Custom orders are always welcome, and I will happily paint and design from any photo or description you send my way. My name is Gerry and I love hummus! I made carrot hummus a couple of months ago and I will seriously NEVER LOOK BACK! Love this recipe! I love hummus and don’t make it nearly often enough. This looks fantastic! What a neat idea adding carrot, I’ll need to try that the next time I make hummus! Thanks so much. Glad you like these Mardi Gras beignets.